My little brother Scruffy moved away when our people-brother moved out shortly after college in 2005. Scruffy has only been back for brief visits a few times since. We bears miss his scruffy little face. I should say that Scruffy was technically “bear-napped”! He’s really mom’s bear. My theory, he was brainwashed by Brother T. He told the little guy that he needed a roommate. That it would be a grand adventure and all. Well Scruffy came to visit with us at the end of February. He told us his only big adventure is sitting up high on a shelf and how Brother T is hardly home. How he never gets to watch TV and hardly a movie, since Brother T hardly ever watches those. I don’t think he really wants to go home. Hehee technically he is really home. Mom made him some new clothes. Welcome to the official launch of Buttons Because a bear’s blog – a bear’s life, as told by said bear. In case you just thought all stuffed bears just sit around all day doing nothing, we don’t! There's always a mad scramble to get back in place when we hear your key in the door. My name is Buttons and I’m new to this thing called blogging. My Aunt Cheryl suggested to my mom recently that she should let me have my beary own blog. So I could share my stories with others. So we’ve been looking into it for a little while now. I wanted to know if there are any other bears out there who blog? I found some, yeah! 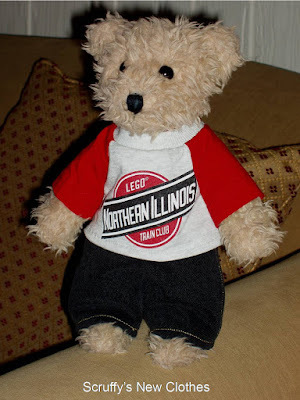 I’ll just be the new bear on the blog for while out there in cy-bear space. I plan to share some past adventures and new ones too. You might catch a post from one of my bear siblings or a friend may stop by to help me tell a story. They’ve told me they would just love to share their version of things around here. I’m not too worried, because I still have the final editorial say. I might share a tasty recipe that either my grandma or my mom has made. Mom said she might even let me share one of her craft or sewing projects with you. Thanks for visiting my blog. Don’t be a stranger, come on back and see what I’m up to. I’m always up to something!